I'm finally back in the office and pleased to share more info about the ISPA EXPO 2010. Global Systems Group had a great show and we thank all of you who could join us in Charlotte, and we look forward to sharing our new equipment with those of you who could not attend. This highly affordable Porter vertical handle system works in conjunction with the strap maker and cutter system shown separately. This efficient handle machine easily adds handles to mattress borders in the border work cell. This efficient method is dependable and easy to operate. 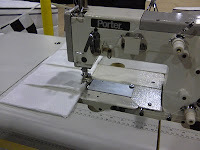 The strong handle sewing secures the vertical handles to the edges of the border material. Porter International has once again provided the mattress industry with an efficient, reliable system for another popular application. Contact your GSG rep to learn more about this border work cell. The show is over: now the real work begins!